I promise, I'm not a one question and disappear guy, hehe. I've been searching far and wide for this answer and can't find it. Then I stumbled on this fantastic site. If nobody can help me directly then I bet someone here can point me in the right direction. I received a 51 as a "gimme" in a multi-gun deal a while back, (26XXX). It's in okay shape and is missing a grip, but that's not the main issue. Nine slide serrations, unmarked barrel, Remington marked frame, and marked magazine. 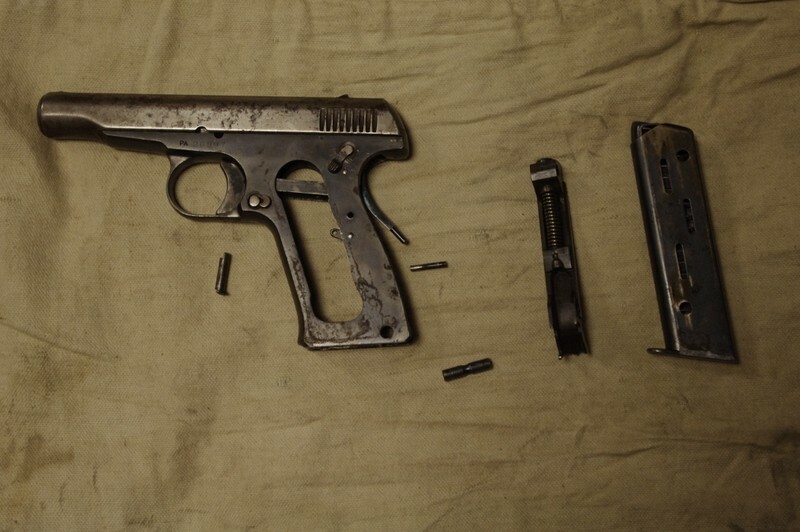 The gun is assembled with the backstrap safety removed. You can see my issue. How can I disassemble it? Everything I've read says the backstrap safety must be pressed. Can I do that manually with the slide already attached? I want to take it all the way down to see if I'm missing any other parts. Barrel pin and both the large and small pins are removed from the frame as well. I am interested in original grips WITH plates if available. And yes I know they are costly. Thanks. Pics of your 51 ( caliber ?? ) should be taken and posted here, if you know how to do that. Might be useful to determine what your stage of problem is. For now.. yes original grips are expensive, try to find a broken set with the backing plate still attached and go with a repo set as replacements until an original set complete and in GOOD condition shows up for sale.. Pistol is a .380, and I'll try and get a picture up. Looks like step one... Remove the slide/barrel/breechblock ( if still there ) all in one piece, gives you viewing access to the frame,, safety looks like it's in the incorrect position. After removal of the slide/barrel/breechblock ( if still there ) all in one piece, move manual safety lever into an up position, setting level with frame, pull trigger and your mainspring rod should drop down and out of place. Let us know of your progress !! The issue is, well I guess it is, since the backstrap safety cannot be pressed, the barrel doesn't move. Am I incorrect in this thought? p.s. Maybe I'm WAY off, hehe. To remove the slide, you have to move it to the rear, then grasp the barrel and pull the barrel and slide forward. If I remember correctly.. a few of the early drawings ( before being favored to be made as you have ) and a very few of the manufactured prototype models had this feature, but regular production models did not have this " twist the barrel to remove " feature. Like ChuckD states in his reply to you... " move slide to the rear , then grasp the barrel and pull the barrel and slide forward. " I have been humbled by the 51, only to be brought back by my new found friends here. Thanks for your help and patience in educating me on this. It is much appreciated. The safety can be spun freely all the way around. Doesn't seem right. Something broke or missing perhaps? When I pull the trigger, yes I put a magazine in hehe, it doesn't go forward on its own power. I have to pull/shake it. It will stay forward, but seems "loose" with forward and backward motion. It will move regardless of the safety position. Suggestions? And I'm not afraid of complete disassembly if that is what it takes to figure it out. Unless you personally have done a COMPLETE disassembly of one of these before...my advice to you is... DON'T!!! If you do get your Rem 51 completely broken down into each part..and then can't remember how to put it ALL back together..or have a lost part due to the disassembly process.... A shoebox Rem 51 is what you will have. How can I ever get experience with this if I don't try? I have $0 in it. As it sits, it doesn't work. In several parts in a box it still won't work. No harm done, hehe. Is there something else crazy about the inner workings of it or something that separates it from being at least similar to other auto pistols? I've completely disassembled many guns. Seems that has not happened. I know it's been two years but the pistol still sits as it was in the picture. It has been put on the way back burner, hehe. Been super busy with AR projects and such that I know I can hammer out, hehe. Sorry for the disappearance but I don't know that I have anything intelligent to contribute, hehe. IT'S STILL IN THE SAME SHAPE, NOW DONE AND IN USE, STILL ON THE VERY "BACK BURNER" ???? INQUIRING MINDS, HERE, WANT TO KNOW !! !